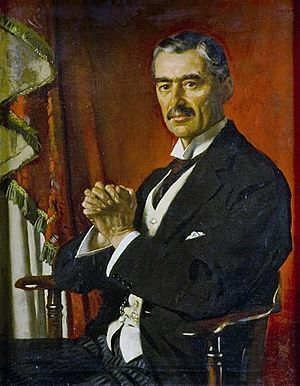 Arthur Neville Chamberlain, (surname pronounced: CHAIM-BER-LIN; 18 March 1869 – 9 November 1940) was a politician, Lord Mayor of Birmingham, Chancellor of the Exchequer and British Prime Minister from 1937 to 1940. Neville was born in Edgbaston, in Birmingham. His father was Joseph Chamberlain, an important politician. His half-brother (they had different mothers), Austen Chamberlain, also became an important politician. Neville went to Rugby school. He became interested in botany (plants), birds and fishing. Neville also loved music and literature (reading). 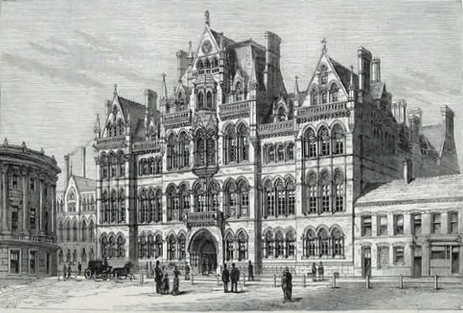 He studied metallurgy at Mason college, which Joseph Chamberlain later made part of the University of Birmingham. Later, he became an apprentice in an accounting company. Neville became a successful manager in a manufacturing company. In 1911, when he was 42, the people of Birmingham elected (chose) him to be part of the city council. On the council, he had the job of planning improving the city, the same kind of work his father had done. He planned new houses for poor people. In 1915 he became Lord Mayor of Birmingham, also as his father had done. In this job he did work to improve the city, including starting the Birmingham Symphony Orchestra. 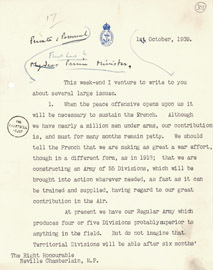 In 1916, the prime minister, Lloyd George asked Chamberlain to manage the department in control of conscription, making civilians become soldiers in times of war. 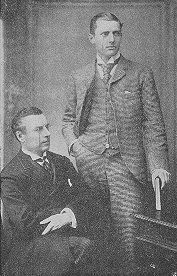 Chamberlain and Lloyd-George often argued, and soon they did not like each other. Chamberlain left the job the next year. Instead, he entered the 1918 general election and became the Conservative Member of Parliament for Ladywood in Birmingham. In 1923, the prime minister Andrew Bonar Law made Chamberlain the health minister In this job, Chamberlain did more work to help poor people. For example he made a law that connected rent prices to how good the building was. Chamberlain was then Chancellor of the Exchequer, in charge of the economy, for a short time. After the 1924 general election, he became health minister again, where he stayed until the Conservatives lost the 1929 general election. Between 1924 and 1929, Chamberlain helped to make many new laws to help poor people, including a pensions system that helped to make Britain's welfare state after the Second World War. In 1929, the Conservatives lost the general election, and Ramsay MacDonald became the new Labour prime minister. At this time, the Conservative party was trying to put tariffs (taxes) on imports to make trade in the British Empire stronger. Other people, including Lord Beaverbrook, a businessman who owned a lot of newspapers, disagreed, saying that trade should be free. Lord Beaverbrook started a new party to fight the Conservatives. Chamberlain fought Beaverbrook's part in an election, and won. This made him very popular in the Conservative party. An economic crisis in 1931 led to another general election. After the election, Chamberlain became Chancellor of the Exchequer. In this position he worked to cancel debts from the war. In 1932 he was able to start a tariff system. His father, Joseph Chamberlain had spent a long time working for a stronger British Empire when he was foreign secretary. He also worked hard for a tariff system before he died, because he believed it would make the Empire economically independent. Neville was pleased to make his father's wishes come true. By 1934, Chamberlain felt that the economy had recovered. However, at this time many important people, including Chamberlain's half-brother Austen and Winston Churchill were warning that Nazi Germany was rearming (building its military). These men said that Britain must rearm, too. In July 1934 the government told parliament that it had a plan to make the Royal Air Force much stronger. However, not everybody was happy to see an arms race (a competition with Germany to build a bigger military). The First World War was still in people's memories, and there was a pacifist feeling in the country. Chamberlain advised the prime minister, Stanley Baldwin, to talk about rearmament in the 1935 general election. Baldwin was worried people would not vote for them if they talked about making the military stronger, so he talked about housing and unemployment instead. Chamberlain worked hard with a slow economy. The government bought factories that were not being used, and spent money making them new again. This idea helped when the war began because Britain had the most modern equipment. When he announced (told the public about) his budget (plan for the economy) in 1935, the Labour party said he wanted war. Other people still said he was not doing enough to build the military. In 1936 the government announced plans to build the Royal Navy. Stanley Baldwin retired in 1937, and Chamberlain became the new prime minister on the 28th May. Chamberlain is mostly remembered for being the prime minister as Europe moved into the Second World War, but as prime minister he also made some important changes in Britain. He made laws that made working conditions better. He limited working hours for women and children. He introduced paid holiday for a large part of the population. He introduced laws to try to make the population healthier by exercising and medical inspection. Many other changes were planned, but the start of the war stopped these changes from happening. In the 1930's, the Irish Taoiseach (similar to a prime minister) was Éamon de Valera. de Valera worked to make a new constitution (set of laws) for Ireland. He wanted to make Ireland independent from Britain. Ireland had its own government, but Britain still controlled Northern Ireland, and had naval ports (called treaty ports) in Ireland. de Valera wanted this control to stop. Chamberlain wanted Ireland to support Britain if there was a war because he knew that without Irish help, defending the Atlantic Ocean would be difficult. Chamberlain and his Secretary of State, Malcolm MacDonald made an agreement to give the treaty ports back to Ireland, but hoped that British warships might use them in the war. Many Conservatives, including Winston Churchill, (who had made an agreement to have the treaty ports in 1921) disagreed strongly with this plan. This agreement, together with a plan to limit the number of Jewish people moving into Palestine (which was controlled by Britain at this time) made Chamberlain unpopular with many people. Chamberlain returned home with Hitler's promise not to invade other countries. Although many people warned about the threat of Nazi Germany, Chamberlain only chose ministers that agreed with him, and wanted to avoid war. Chamberlain, together with many people of the same age, were very worried about war. They believed that people like Adolf Hitler were in power because their people felt that their situation was unfair. German people felt that the Treaty of Versailles (an agreement made to end the First World War) was unfair. When Nazi Germany invaded (took control of) Austria and the Sudetenland (a part of Czechoslovakia), Chamberlain tried to keep peace. In September 1938 he flew to Munich to speak with Hitler. Together with the French prime minister, Édouard Daladier and the Italian dictator, Benito Mussolini, he made an agreement with Hitler. Hitler was allowed to control the Sudetenland, but had to agree not to use his military to solve future disputes (disagreements). When Chamberlain returned home, many people said he had done a wonderful job. Chamberlain was very pleased, and said that the agreement meant "peace for our time". In March of 1939, the German military moved in to control the rest of Czechoslovakia. This was against the Munich agreement. Chamberlain realised that his attempts to control Hitler had failed. He started to get Britain ready for war, using the new factories that had been built. Many new weapons were built, including the Supermarine Spitfire (a fighter aircraft), and radar. 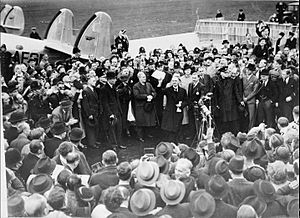 When the Germans invaded Poland on 1st September 1939, the British and the French talked together and decided to declare war on Germany (tell Germany war had started). Chamberlain spoke on the radio, and told the British people that war had begun. Chamberlain made a new government, and included Winston Churchill. After the Germans invaded Norway in April 1940, the British sent a naval force to fight them. The plan was not a success, however, and parliament no longer supported Chamberlain. on 10 May 1940, Chamberlain resigned. Churchill became the prime minister, but Chamberlain stayed in the government. Later in May, Germany offered conditions for peace (things they wanted to stop fighting). Most of the government, including Chamberlain, wanted to agree with Germany and stop fighting. Churchill did not want to agree with Germany. He spoke with Chamberlain, and soon Chamberlain began to agree with Churchill. The result was that Britain stayed in the war. In the summer of 1940, Chamberlain became sick. In July he had an operation on his stomach to treat cancer. He tried to return to work, but became too weak, and had to retire. He died on 9 November 1940 of bowel cancer. He was 71 years old. Winston Churchill spoke to parliament to tell them about Chamberlain's death. He praised Chamberlain as a good, honest man. People disagree about the history of Chamberlain. Some people think that his actions were wrong because he did not stop Hitler. Other people say that he gave Britain and France more time to get ready for war. Neville Chamberlain Facts for Kids. Kiddle Encyclopedia.